In medieval times alchemists sought the Philosopher’s Stone, a substance that was believed to be capable of transforming lesser metals into gold. Unfortunately, the Philosopher’s Stone has remained elusive, and the quest for riches turned from creating gold to finding it. Finding gold, however, is an arduous endeavour. Those joining the hunt had to travel to the most remote parts of the world, from the Amazon jungle to the Yukon in Alaska. Once there, prospectors had to sift through tons of rubble to wash out the grains of gold that luck may have hidden there. Ultimately, only very few diggers actually became rich. 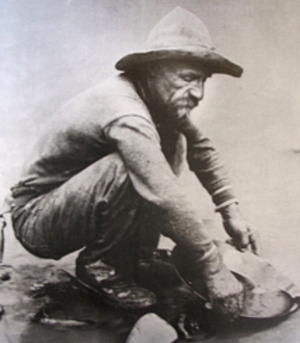 How gold is searched for: A prospector in California, 1849. Doing data science for SME financing often feels similar to prospecting: Instead of tons of gravel, the data scientist sifts through tons of data (credit applications, accounting data, books of receivables) in search of valuable nuggets – i.e. the low-risk suppliers to lend to. But what if, at least here, the Philosopher’s Stone was more than a myth? What if it was actually possible to transform the SME’s risks by re-focusing the analysis? For thousands of SME suppliers trading with large corporate buyers, this can be done. An invoice by a small, credit-challenged supplier may have a terrible supplier risk, but it could have a very high probability of being settled. If the buyer is a highly rated, multinational corporate buyer, this invoice is a very attractive risk to finance to the benefit of the supplier. The important question is the buyer’s likelihood to settle the invoice, not the SME supplier’s credit risk. Accessing this opportunity requires, however, the ability to accurately measure the probability that a given invoice will be settled by the buyer. This can be done by leveraging the data in the ERP systems of the large corporate buyers and training a state-of-the art ML-based scoring algorithm on it. This algorithm produces a “probability of settlement” for any invoice, without any limitations to scale or scope. 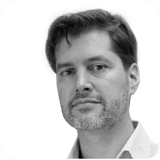 Hence, the advent of modern machine learning has made possible in the field of SME financing what medieval alchemists could only dream of: The transformation of leaden SME risk into golden investment-grade large-corporate risk. However, this transmutation required a technology that would have been inconceivable to a medieval alchemist. 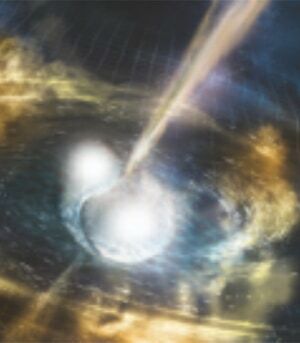 How gold is created: The gold produced in the neutron star collision detected in October 2017 is estimated to have 10 times the mass of the earth. We at Previse are proud to have pioneered this new, AI-driven approach to trade finance. Incidentally, Previse is not based near the sites of the 1849 gold rush in California, but next to the London terminus of Hogwart’s express at King’s Cross, whence 20 years ago Harry Potter embarked on his search for the Sorcerer’s Stone. Previse’s corporate colours are yellow and grey. Any similarity to the colours of gold and lead are pure coincidence.